When four strangers move into Blackpool Cove the same week a tragic shipwreck befalls its shores, Trixie Muldoon waves it off as coincidence. Even the arrival of the appealing, young investigator, David Durham, does not convince her otherwise. But when a girl disappears, it's obvious something sinister has gripped the quiet, coastal town, and it all leads back to the town's newest inhabitants, including the mysterious Beck Ryker. Everything about Beck Ryker, his scarred face, his hypnotic gaze, his seemingly tortured past, says heartbreak and regret. Yet Trixie finds herself drawn to him. But when the tangle of secrets surrounding Beck unravels, Trixie finds herself caught between terror and passion. Review: Blood Tide is set in the 1880s in a small town called Blackpool Cove. I didn't realize the exact year that this book was set in until I read a blurb on Goodreads halfway through reading. From the writing style that the author, Tess Oliver uses it is very obvious that the story sets in a different era. I enjoy period pieces, but I understand that some do not; there fore, this book may be set in the 1800s, but I also think it naturally flows well with the story so that a person who may not favor period pieces, could still enjoy this book. 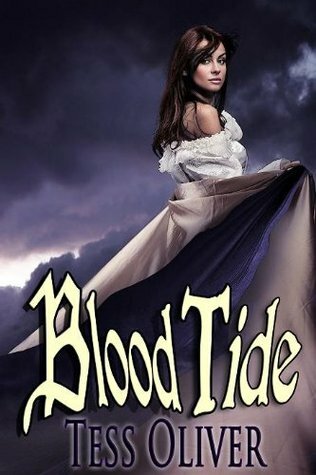 Blood Tide is a mysterious paranormal book- it has a person wondering about these odd people who just moved into town are. Troublesome occurrences continue to arise while they are they- the town was peaceful prior to their settlement. It is difficult for me to praise the plot and explain the characters- without giving away huge spoilers. And these spoilers were the reason I really enjoyed this book- something I totally didn't see coming!! So instead, I'll just explain that these mysterious characters that come to town are rather unusual; but at the same time they blend in quite well with the other people who live in town. No one suspects anything about them until strange events contunue to take place and some residents begin to question these newcomers. This book really begins to pick up about halfway through. The beginning for me was just, okay. But once the suspense was full, I couldn't wait to read more and once the plot began to unravel, I couldn't turn the pages fast enough. Beck, one of the four... is my new book boyfriend. I loved his character! This could possibly have to do with the secrets he reveals to the young lady he falls for, Trixie. Trixie lives in Black Pool with her Grandpa and Mami. The relationship they have with each other is tight knit. I enjoyed their family interactions; it reminded me what family is supposed to be about. The characters the author brings into the storyline are wonderful- Tess knows how to balance out a book by adding certain characteristics and personalities into each individual. Trixie, the responsible but adventurous and daring persona is balanced out by her exuberant and flirtatious best friend Piper. The haunting occurrences keep a person interested to find out more, but at the same time the subtle love story keeps the same effect, but tames down the haunting vibe a reader may feel. Overall, I enjoyed this book, especially once I got to the halfway point. Took me a while to get into it, but it is still an worthwhile read. I'd recommend for more mature teens, or younger advanced readers. Very interesting book! The book is laying on my shelf for a long time and I couldn't begin to read it! In vain! This book is very interesting and well thought out heroes! I work a writer and you have the opportunity to hire a lab report writer now. I recommend reading this book to everyone, I think it will come to everyone's liking!